Smorgasbord Laughter Lines – Guest Comedians D.G. Kaye and Eric and Joy Lennick. I have two guest comedians today…some funnies that were spotted by D.G. Kaye Writer Blog and Eric and Joy Lennick Amazon have contributed the joke..
shut her old man in the freezer. I hope you have enjoyed these funnies and if you have any you would like to contribute, new material is always welcome… send your favourite jokes to sally.cronin@moyhill.com and get a mention for your books and blog too..
Posted on February 20, 2018 by Smorgasbord - Variety is the Spice of Life. A welcome back to to Debby Gies with one of the posts from her archives to share with us today. When this post appeared last year it was met with rave reviews and for weeks on Facebook we were all announcing to the world our new status.. A Perennial Woman..
How many times have we said we don’t feel or look our age? When did middle-age sneak into our lives? Where did the years go? I’m sure we’ve all begged the answers to those questions once or twice as we women approach our ‘Perennial’ years. What comes to mind when women use the terms ‘the new 40 or 50′, even 60 or 70? Here’s a clue: it encompasses so much more than just looks. In my opinion, looks have changed since the last generation, without discounting so many other changes that have occurred through the decades to empower women. Women in their 40s and 50s look much younger than those from decades past. I’m not referring to the advent of cosmetic surgery, but when I look back on decades past, I notice some interesting hairdos and fashion statements. Looking back at the women in my own family and even movie stars with the styles of yesteryear, it’s not hard for me to compare a woman of today in her 40s or 50s appearing younger looking than those before us at the same age. Was it the hairstyles, a more sedentary lifestyle which gave the impression a women in her 30s back when of 30 or 40 years ago looked similar in age to women now in their 40s or 50s? I have to laugh at the many times me and my sister would bring up the subject of our dreaded childhood weekends we were forced to spend at our paternal grandparents’ house. We’d remark to one another about how even when we were small, our grandmother looked like . . . well, a grandmother. We only envision her old from as far back as we can remember. But lol, I digress. What made me write this post on women then and now was prompted by a conversation I had on the weekend with one of my sister-in-laws. She shared a topic of discussion that came up between her and her yoga teacher. Her teacher had referred to women in the age group of 40s and 50s as ‘perennials’. Have any of you heard this term used before? I haven’t. But I love it. I’ve heard of some more unflattering terms such as menopausal, even cougars, but not perennials. According to the yoga teacher’s preferred term, perennial, it represents this age category because many women are reaching their full potential, ‘in full bloom’ as they enter their 40s and 50s. This age bracket is where many women enter new phases of life such as: the empty nest stage where their kids are finally moving out or getting married, making new lives for themselves or raising families. This is a time where women begin to re-evaluate their accomplishments and desires and come to realize they want to do things that either they may not have thought about doing when they were younger, or were too busy raising their families or building careers, choosing to put their own desires on hold. I can identify with this wonderful choice of word, perennial, representing a time period of continuation of our evolving. We are still evolving and learning and doing. Every year we bloom with more knowledge from our experiences and eventually, the new bloom leads to desires of the ‘me time’. A time for us to focus on the things we enjoy whether it be travel, new hobbies, furthering our education, or even writing books. So much can apply to this ‘new age’. The possibilities are endless if we allow ourselves the entitlement to flourish and bloom to complete ourselves for ourselves. I absolutely adore the term ‘perennial’ and it does sound so much better than ‘the change’. In fact, there may even be a book from me down the road on the subject. How do you feel about the term ‘perennial’? I am sure that Debby would love to hear your answer and receive your feedback, and I look forward to reading both on my return tomorrow. Thanks to Debby for another wonderful post. Thanks again to Debby for sharing this very popular post from her archives. Posted on January 29, 2018 by Smorgasbord - Variety is the Spice of Life. 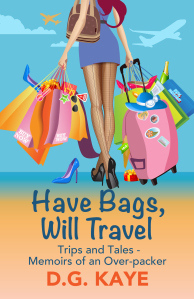 Welcome back to the second of post from the archives of Debby Gies...this post amused me as well as inspired a recent purchase – yes I am a shoes hoarder too….and Debby is absolutely right. Life is too short! D.G. 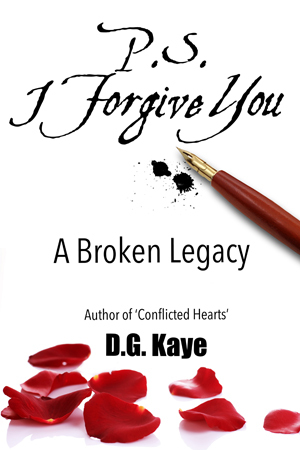 Kaye writes memoirs and non-fiction including The Words We Carry. The book explores the damage that can be done to our self-esteem with unguarded or unkind words when we are young. As a writer, I have immense respect for fellow writers who share their personal journeys and challenges with the sole intent to help ease the burdens of others. 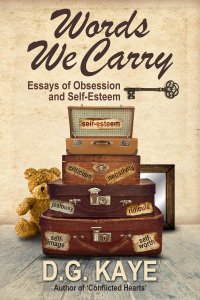 In Words We Carry: Essays of Obsession and Self-Esteem, Author D.G. Kaye not only shares her very personal journey to self-worth, she does so with an enlightened, grateful heart. Personally, I loved Kaye’s candid, engaging, and often times humourous writing style. This is an incredibly personal read and one that offers guided hope and encourages self-reflection. Our lives are shaped by our experiences; every encounter, every moment holds the capacity to build us or break us. Our resiliency to endure and overcome, in large part, correlates with how we see ourselves, how we value our self-worth. Kaye doesn’t profess to be an expert on this topic; the value of this book lies in the authentic approach in which she shares her personal journey. Our self-esteem and personal acceptance are intrinsic to a life of fulfillment, a life of joy. Our ability to celebrate our unique qualities and embrace our imperfections is not a simple endeavour, but it is possible. Amazing things transpire from this inner peace, and this memoir is a testament to that truth. Kaye brilliantly shares her journey to self-love, her tenacious spirit shines bright, her words are an offering of hope for those who may be struggling to chart their own course. Her approach is genuine, her encouragement sincere. She is in your corner! A highly recommended high-star read! My thanks to Debby for this inspiring invitation to partake in life’s small pleasures.. and since we are being open about some of these small things that make us happy….. how about putting your secret vice in the comments section…. within reason!!! Posted on December 6, 2017 by Smorgasbord - Variety is the Spice of Life. Delighted to share a post from the Christmas Archives of D.G. Kaye.. Debby Gies. This is probably one of the most expensive times of the year and when you have an extended family, finding presents and budgeting for them takes creativity.. Debby has some great ideas to make every dollar, euro or pound count. The holiday season is fast approaching, and once again people are picking their brains about what gifts to buy for friends and loved ones. I’ve always tried to tailor my gifts specifically to what the receiver would like and could use and/or appreciate, in hopes that my gift wouldn’t be the one ending up collecting dust on a shelf or re-packaged for re-gifting. But it’s still sometimes difficult to pinpoint exactly what the perfect gift could be for someone, and, often times, there might be too much cost to purchase a particular gift, which sometimes leaves us feeling somewhat inadequate with what we’ve chosen to give, especially for those hard to buy for people who already have everything they want. Sure, it’s the thought that counts, but sometimes people don’t think that way, and sometimes our budgets don’t allow us to spend on some items what we’d really like to give. So today I’m going to share some great ideas for gift giving for both children and adults. Below are some ideas from low cost to no cost that you can give with confidence and know they will be well received. Have you ever noticed children at a Christmas gathering opening one gift after another, barely taking in the excitement of one gift before they put it aside to open the next one? Have you ever noticed how much kids love to do arts and crafts to keep their busy little hands and minds occupied? This is why crafts make great gifts for kids. Maybe it’s the writer in me, but I like to buy gifts for kids that help to educate them and help to build their creativity. Books – books that entertain while teaching kids to count or learn the alphabet, colors, names of animals, and of course, any stories to do with kindness that can be understood at their level. These are just a few of so many things we can give. Our imaginations are limitless when we think about what a particular person could really use and appreciate. And don’t forget, there is nothing more personal than any gift from the heart. Brand new release on December 1st. This early review for one of the Beta Readers. Negative words thrown at us with disregard when young can linger for a lifetime. Words We Carry is packed with the accumulated knowledge, wisdom, survival tips and strategies from someone who went through difficult and unhappy childhood and teen years. I think it is fair to say that most of us are less than confident about our body shape, and that is particularly tough when you can no longer use the excuse of puppy fat, and your friends are heading out in slinky black dresses and high-heeled shoes. Unfortunately, not all mothers are born with the nurturing gene and as soon as you become competition, there is an opportunity to reinforce your lack of self-esteem with carefully chosen and cutting words. I would like to think that the experiences that D.G. Kaye describes were rare, but I am afraid that after counselling women on their health and weight for twenty years, the story is very familiar. Those harmful words from those who are supposed to love us, are the ones we carry throughout our lifetime, unless we can find a way to dilute their power and replace them with affirmations of a much more positive nature. D.G. Kaye describes her strategies to claim her own identity, build her self-esteem and evolve from the ugly duckling that she had been made to feel she was, into a swan. This involved a makeover in a number of departments, including wearing high heels at all times and over every terrain, and standing out from the crowd with her now signature titian hair colour. She also developed a healthy, outgoing personality and independence that led her to discover groups of people who accepted and embraced her as a friend. In the second section of the book Kaye looks at the impact this early negative conditioning had on her relationships, including romances with older men whose different approach to dating and expectations provided a more secure environment. Unfortunately, having entered one serious and long-term relationship, echoes of the verbal abuse that she received as a child and teenager, threatened to undo all the hard work that she had accomplished. Thankfully she went on to find happiness and empowerment with someone who appreciates all that she has become. Kaye looks at issues such as the difference between Alone vs. Lonely, Negativity and Self-Worth, Forming Healthier Relationships, and importantly Exposing our Personality Through the Internet. All the chapters provide commonsense strategies to overcome a lack of self-confidence, and I do think that women and men in their 50s and 60s, will definitely be able to draw parallels to Kaye’s own experiences. Whilst I recommend this memoir/self-help book to men and women of my age, I also think that it should be read by all mothers whose daughters are heading into their teens and beyond. It might just remind them of how fragile their child is when about to face the outside world, and that there are enough external challenges to be overcome, without encountering them in the place they should feel safe. It is also a book for young women who are struggling with weight issues and those who feel that they are not as attractive as their friends, or who feel that they are somehow going through something never experienced before. There is no reason to reinvent the wheel. By reading this they might take strength in knowing that this is an age old problem, and that they can change the narrative and write their own story. This week I have been reading The Words We Carry by D.G. Kaye and would like to share my thoughts with you on the book. My review for Words We Carry. Posted on December 11, 2016 by Smorgasbord - Variety is the Spice of Life. Recently Debby published a poignant and thought provoking memoir titled P.S. I Forgive You, about her turbulent relationship with her mother that echoed down the years even after her death. Of course there have been some great reviews and I will tell you more about the book later. As each December approached, I’d take in the views of the glorious glow of Christmas lights and decorations sprouted everywhere, from the street light posts to the homes we’d pass while driving by them, sparkling in all their glory. I was a child and wanted so badly to be part of Christmas. Coming from a family that didn’t practice much of religion, and having Orthodox Jewish grandparents on my paternal side, didn’t afford me the luxury of having a Christmas tree. This didn’t mean that I didn’t love Christmas and all special festivities I’d witnessed on TV and from visiting friend’s homes who celebrated. I envied the kids who spent fun times with their families, doing traditional holiday things such as wrapping presents, singing carols and most especially, decorating the tree. Oh how I longed to have a bright and sparkly Christmas tree in my home. When I was very young I didn’t understand why I couldn’t be a part of the festive season, and nobody explained religion to me, other than being told by my grandparents that Jews don’t celebrate that holiday. I’d remembered hearing snippets of memories my mother had mentioned in passing about her lack of Christmas festivities in her own childhood because they were poor, and even though her mother loved Christmas, they didn’t celebrate it because my maternal grandfather was Jewish. I felt empty inside. I felt trapped and confused wondering what kind of religion was I part of where we didn’t celebrate the universal Christmas, and the holidays we did celebrate were not near as much fun. I wanted to be a part of a family celebration, and other than seeing the menorah lit at my grandparents’ house or gathering there for a compulsory Passover dinner, which consisted of what felt like hours of sitting at the Seder table listening to Hebrew prayers, we didn’t celebrate anything. This didn’t quench my fascination and longing to celebrate with loved ones, nor did I feel any bonding; something I craved much of as a child. I wanted to wrap up shiny presents and give them to people I loved. I wanted to give gifts even more than I wanted to receive them. I wanted to sing to Christmas songs and wake up Christmas day and run to the tree and open presents with my family. When I turned eleven, my excitement for Christmas had only heightened. I decided that I just had to be a part of the tradition, if only in a small way. So I began my own ritual. I was the eldest of four—the mother hen of my siblings. We were alone together much of our childhoods and I wanted to get them as excited as I was about the Christmas holiday spirit. I saved my allowance and went to the local drug store before Christmas Eve and bought candy and little prizes with the coins I had saved, so that I could fill stockings for them. I told my siblings to hang a sock over the fireplace before they went to bed on Christmas Eve. And I made up little Christmas stories to convince them that Santa loved all children, and told them if they would be good and not fight, Santa would come to our house too. I filled those stockings for a few years, until the younger ones realized, as they were getting older, that there wasn’t really a Santa. But for those four to five years, I filled their imaginations and stockings, and they believed in the magic of Christmas. Through those years, I wanted a Christmas tree so badly, and I never gave up asking my mother to allow us to have one, to no avail. I even tried to sell her on the idea of getting a Hannukah bush, but that never happened either. When I moved away from home, still in my teens, I got my first tree. I couldn’t wait for Christmas to come so I could go and buy the biggest tree I could find that would fit in my living room. It was a Scotch Pine, and I didn’t realize just how humongous it was until it ‘thawed’ and drank lots of water, until its branches unfolded to almost eight feet wide! I also wasn’t aware of the potential aftermath of prickly Scotch Pine tiny needles left fallen deep inside my shag carpet, long after Christmas passed. Excitement filled me as a friend took me to a tree farm and I picked out my first beautiful tree that he happily loaded on his truck and helped me carry inside my small apartment. The thrill continued when I went out the next day to purchase my first sparkly, Christmas ornaments to decorate my very own tree. First time experiments aren’t always conducted with great expertise, and when we’re young we don’t always seem to worry about repercussions. By the time the season ended, that tree had grown so ginormous and needles were falling at lightning speed. My thick, blue shag carpet had already had many needles buried deep within it and when it came time to throw out the tree, I shuddered at the thought that most needles would have fallen off before I got it to the front door, so I resorted to Plan B. The 14 x 14 inch window was only a few feet away from the tree. A few pals came over, helped me move the couch away from the window, and somehow we managed to fit that 8 ft x 8 ft tree out the window then retrieved it quickly before the superintendent would see it, and carried the almost bald branches to the garbage room. About P.S. I Forgive You. And one of the latest reviews. For Everyone who has or is attempting to be in a better place from where they came! I have always felt that something good can always come from something bad and this book clearly proves it. D.G. Kaye is the good that has for some blessed reason come from a horrific childhood. Her mother trumps the fictional mom in Yaya Sisterhood played by Ashley Judd and Ellen Burstyn about a very selfish and narcissistic woman! Whose line in one of the scenes was “Do I look fat?” The sad thing was this book is not writing about a fictional character but a mother who raised an amazing daughter in-spite of her lack of knowing how to love anyone but herself. I have sent this book to two friends that I feel can relate and need to know that they are not alone and can rise above where they came from and not feel guilt for being angry at their moms. This book is sad but empowering. Showing that you are not your mothers! Posted on August 29, 2016 by Smorgasbord - Variety is the Spice of Life. Welcome to the women’s health week revisited and I am so pleased that author D.G. Kaye accepted my invitation to guest post last year. She shared her story about a health issue that could have gone unnoticed at great risk to her life. Thankfully she is now fully recovered and definitely firing on all cylinders. Connecting the Dots by D.G. Kaye. It was the tiniest of dots; not much bigger than the size of a pinhead. Most people wouldn’t even have paid it any mind. But I am not most people. As a girl who has experienced her fair share of health concerns, I made a pact with myself to practice a healthier lifestyle and to become more in-tuned with my body. I wouldn’t categorize myself as a hypochondriac, but because I have been challenged with cervical cancer, glaucoma, and a near fatal diagnosis of Crohn’s disease at the age of forty, my instincts instruct me to pay close attention to any suspicious “red flags” that capture my attention. I am blessed to have a most wonderful Naturopath who has guided my health for the last decade and he has given me quality living with my Crohn’s. I was also blessed with an angel; my Dermatologist. I became fascinated by a tiny red dot on my right forearm. Months had gone by and I was puzzled as to why it was still there, so I kept mental note of it every time I glanced it. I just found it strange that this tiny red, transparent speck had taken up residence on my arm and wouldn’t go away. It never hurt, nor itched; it was just there. I followed my intuition and decided to take action. Ironically, this wasn’t the first call to action. I had previously shown it to my husband’s Dermatologist two months prior, and he offered to burn it off. He was a very old gentleman, and I had mentioned to my husband that I thought this doctor was ready for retirement, as he didn’t see very well. He never used a microscope and seemed always too eager to burn things off. I didn’t feel at peace with the issue so I wanted to seek a second opinion. When I met Dr. Allen, I sensed her compassion immediately. She made me feel comfortable with her warm smile and her soft-spoken manner. She informed me that she was going to cut out the dot and send it to pathology; her standard procedure. Dr. Allen stated that she didn’t believe it was anything serious, but as a precaution she wanted to have it analyzed. I was satisfied that I had somebody competent now looking after me. Dr. Allen informed me the results would take about two weeks. Two weeks later, I went back to see her for the results. The doctor informed me that my results came back negative but that she’d also like to send me for an echo-doppler cardiogram for precaution. She explained that sometimes the reason this type of spot appears is that it may be related to a heart issue. She added that it was a long shot but she would feel better just ruling it out. I looked at her in disbelief as she handed me the referral form but I never questioned her thoroughness. Dr. Allen told me she would call me with the results. I left and went on with my day, not really giving the matter another thought. The following week I went for the test. The lab technician was friendly and he explained what he’d be doing, to put me at ease. The scan lasted about an hour and through that time, him, and I chatted as though we were old chums. I watched the screen and I was fascinated to see my heart beat with my every breath. When the test was nearing an hour, the technician suddenly became very quiet. I looked up at the screen and noticed as I breathed; it appeared as though this tonsil-like-looking ball was flicking up and down. Now, I’m no doctor, but I was curious as to what the tonsil-looking thing was that seemed to be suspended from my heart. I suspiciously asked the technician what I was looking at. And then my whole world rocked. It turned out that I had a rare Myxoma tumour hanging off my valve. Dr. Allen expressed her sympathy about her suspicion; even though it was a long shot. I thanked her for potentially saving my life. She was so compassionate and she offered to get me in to see one of the biggest heart surgeons at St. Michael’s Hospital, in Toronto. Within that week, I had gone to meet my soon to be heart surgeon. He was a strappingly handsome man in his early forties. He was also quite curious as to who had sent me for the echo test without a symptom. He explained to me that this tumour was hanging off my valve and if left undetected, it would have eventually dropped off into my lung and embolized, causing sudden death within six months. He also told me that these tumours are asymptomatic, and aren’t generally detected until autopsy; silent killers. The situation was all so much for me to bear but the one constant that kept me optimistic, was knowing that those tumours were never usually detected and God must have wanted me to live. There were too many coincidences in the finding that wouldn’t allow me to believe anything less than I would survive. It all happened so quickly. Within the next two weeks, I was scheduled for open-heart surgery. I got an eye opening view of an operating room as the nurse wheeled me in on a gurney; still fully conscious. I stared at the heart-lung machine that would be sustaining my life, while the good surgeon would hold my heart in his hands. When I next opened my eyes, the room was very dark and quiet. I thought I felt an angel over my shoulder. I tried to speak with an almost inaudible voice as my lips felt glued together. The nurse sitting behind my shoulder said, “Welcome back Deborah.” I was in and out of consciousness for the rest of the night, but I was alive and I had survived. D.G.’s writing relates to her experiences in life, and she shares her lessons and ideas she acquired along the way. Kaye’s second book, Meno-What? A memoir, it was written based on her passage through menopause. In that book, she shares her humor and wisdom on what women can expect at that time, adding some of her helpful hints for relief. 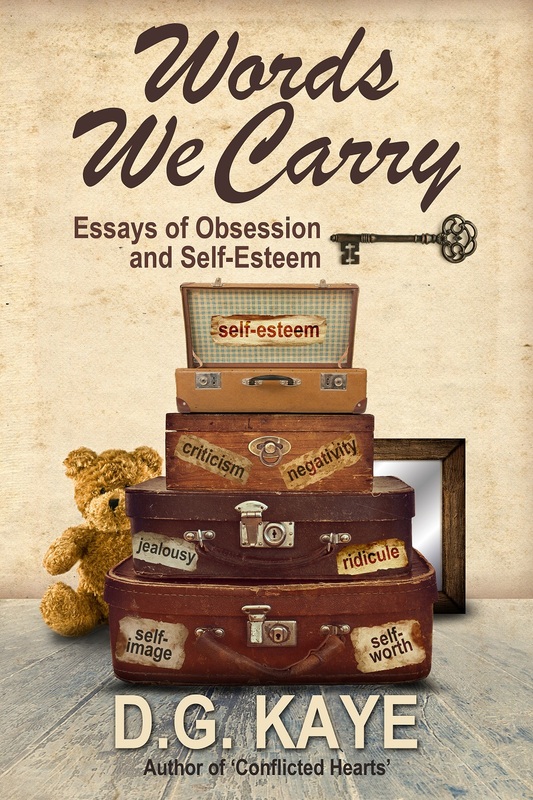 D.G.’s book, Words We Carry focuses around women’s self-esteem issues. She talks about how and why the issues evolve, how she recognized her own issues, and how she overcame her insecurities. Links to buy D.G. Kaye’s books and connect. Thank you for dropping in. I know some of you may have read this post last year but it holds a very important message and it would be great if you would re-share on your own networks.. Welcome to the new series where I will be featuring one of the books on the shelves of the cafe and bookstore. There are now over 100 authors and their books, with more added each week as they are promoted in the regular features. To join the other authors you will need to be promoted in those posts first and here is the link for how you can do this. Book of the Week kicks off with Words We Carry by talented non-fiction author and friend to many of us in this blogging community, D.G. Kaye.. also known as the elegant and charistmatic Debby Gies. It so happens that Words We Carry is on offer all of this week. First here is D.G Kaye with a few words about the book and I have also selected one or two reviews that the book has gathered from readers. Words We Carry focuses around women’s self-esteem issues. My essays focus on my own experiences I suffered from my younger years when I was left to feel inadequate and harbored a deep inferiority complex. Being a memoir, the stories are told through my own struggles, and I share the methods I used to try and conquer my own feelings of low self-esteem. The stories progress with the impact that the residual damages have on our feelings of insecurity as we carry through into life and relationships. Women of all ages can relate to this book. Ridicule, nor abuse of any sort should ever be tolerated. My goal when writing was to share and empower not just women, but men too who have endured similar events in their own lives. A selection of reviews for the book. I just now finished “Words We Carry” and wanted to come here and write a review while it was still fresh on my mind. But it is actually the kind of book that you will draw from as needed in different circumstances as the occassion may arise. It is a journey through this author’s life, describing the effect that words have had on her. And it really makes you think twice. It helps you kind of re-evaluate your own life and agree with a lot of the points she brings up and has you feeling not so alone in your own journey. D.G. Kaye makes you feel as if you are sitting at her kitchen table, just having a friendly conversation about “life” and experiences we have as women. I wish I’d read “Words We Carry” in my twenties! She makes you think that other people think and feel and have had the same experiences as you. She talks about abuse and red flags, jealousy and lonliness. It is empowering and real and was timely for me, since I just quit a job of ten years and am beginning a new one next week! A great gift for young girls just moving away or someone like me who has already lived a half a century, and am starting a new job! Thumbs up on this one!I am becoming an avid fan of D.G. Kaye books!Can’t wait for the next one. Links to connect with Debby. Posted on May 31, 2015 by Smorgasbord - Variety is the Spice of Life. The Sunday Show – A funny thing happened to author D.G. Kaye. 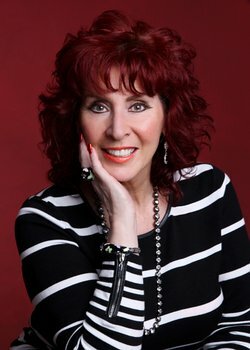 My guest today is Canadian memoir and nonfiction author and blogger D.G. Kaye (D.G.). It is clear that D.G delights both the women she writes for and I suspect the men who sneak a peek with her down to earth and often humorous look at life. There is also a serious side that comes across in D.G’s books and in her blog posts that strips back the layers that are formed in relationships. Those that are good for us and those that are harmful. I will take a closer look at her writing later in the introduction. D.G was born and raised in Toronto where she still lives and writes about her own life experiences, matters of the heart and women’s issues. She began keeping a journal as she lived through a turbulent childhood which was lacking in emotional support from her narcissistic mother. 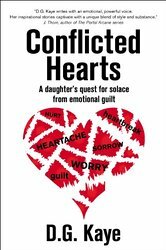 This challenging start in life was the inspiration for her first book Conflicted Hearts. Her second book also charts one of the most challenging times in a woman’s life. Those of us who have enjoyed that ‘time of life’ as it is often referred to seldom see the funny side in the hormonally driven changes in our body. However, D.G manages in Meno-What? 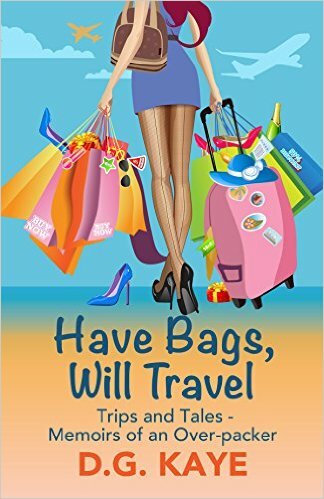 A Memoir, to not only share her observations and wisdom about this natural phase in our lives, but to bring humour and tips for survival! Her third and latest book was featured in the Five Star Treatment, Words We Carry, focuses around women’s self-esteem issues. Most of us tend to have our own unique way of putting ourselves down and D.G talks about how and why we do this and how she recognised and overcame her own issues. Apart from her books, she has also written articles about life, her opinions on people and events as well as contributing poetry and health articles for a Canadian magazine. She is very interested in natural health care and remedies prompted by her own health issues and that of her family. One of the very positive aspects of D.G’s writing is that it always leaves you feeling inspired and motivated to be more pro-active with your life in both health and relationship issues. Here are a couple of quotes that sum up this attitude to life. When D.G. is not writing, she’s reading. Her favourite genres of reading are: biographies, memoirs, writing and natural health. She loves to read about people who overcome adversity, victories and redemption and believes we have to keep learning–there is always room for improvement! She loves to cook, travel, and play poker hence her Twitter handle! Somehow I believed it was my obligation to try to do the right thing by her because she had given birth to me. Yesterday I happened to come across this book and I am so glad that I did. It made me laugh, it made me sad, it made me angry but most of all, it made me cheer for D.G. Kaye! She writes with candor and insight, passion and heart. It is an easy comfortable read, much like having a conversation and I couldn’t put the book down until the conversation was over. You can feel the little girl’s worry and confusion, the teenager’s guilt and angst, the sadness and the searching of the young woman and finally the strength of the adult. Ms. Kaye writes about the affects her mother’s actions has had on her entire life and the decisions she has made but she is never mean spirited about it and it makes you love her more. It is a book that makes you think, reflect, understand and most of all it is a book that shows you that with the right attitude and beliefs, you can forgive and move forward. I loved it! D.G. Kaye uses all her feelings of empathy, compassion, and honesty to reveal the power of WORDS that hurt, destroy, and demean. Words that in most cases have been forced upon us, and we never forget their poignant sting or understand the devastating effects they have on our lives and our relationships. You create the reality that has been engrained in your mind whether it’s wrong, unfair, or just plain mean, spiteful, and filled with envy and jealousy. WE ARE THE “WORDS WE CARRY” THROUGH LIFE! Isn’t it time to delve back to the source to first recognize and then change your self-image, self-esteem, and self-worth? WORDS start piling up at a very young age…long before we understand why such labels are placed upon us by inconsiderate, angry people, usually our families, who lash out at everyone around them in an attempt to make themselves feel better. Who gets hurt? Just about everyone, including themselves. But the delicate psyche of a child, who is born seeking only love and acceptance, is so susceptible to ridicule, negativity, verbal abuse, and degradation. It is rarely a child’s fault that they are bullied, laughed at, used between adults as weapons in grownup games, or called names that stick like glue. Ms Kaye reaches back to her personal, traumatic early years to release the WORDS that practically destroyed a beautiful, giving, loving personality. In her easy, flowing writing style, where you feel like you’re communing with your best friend…sometimes heartbreaking, sometimes comedic, always strong and resourceful…you get the best she has to give to show how you too can rescript the WORDS that keep you downtrodden and afraid to ask for and receive what you deserve out of life. Thank you D.G. for this heartfelt, soul-searching book to set us all free from the “Words We Carry” that only inflict pain and suffering. YOU TOO CAN FIGHT BACK AND WIN! D.G. adds a touch of humor to a tale about a not-so-humorous time. While bidding farewell to her dearly departing estrogen, D.G. struggles to tame her raging hormones of fire, relentless dryness, flooding and droughts and other unflattering symptoms. Join D.G. on her meno-journey to slay the dragons of menopause as she tries to hold on to her sanity, memory, hair, and so much more! Let me tell you that this beautiful woman has a way with words. 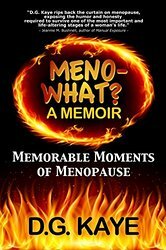 And she will make you laugh as she describes what it’s like to go through menopause. Anyone that can make you laugh while going through menopause is alright in my book. D.G Kaye writes about trying to keep her sanity while her hormones are raging. This is something most women can relate too. There’s memory loss, hot flashes, dry spells, and even the dreaded hair loss. She writes all this and so much more in a fun and informative way. This book is filled with lots of love and even more laughter. D.G. tells you how to take life as it comes and she pulls no punches. She’s a Canuck from Canada that writes from the heart. If you know someone who’s just had a hysterectomy buy this book. In fact every woman reaching that menopause age needs a copy..
D.G writes about life and part of our life cycle is of course death. As we get older we begin to lose those close to us and grief is a very natural part of our existence. It becomes tragic when of course those that we lose are young and vital members of our family. Whatever the circumstances we all have our own way of dealing with the grief and D.G covers this particular issue very sympathetically but also in her usual practical manner. You will also find excellent articles on divorce, anxiety, changes in our perception of the world including how we become less fearless with age and experience. I recommend that you head over and find out more for yourself. Now time to meet D.G (Debby) in person and talk a little more in depth about some of her life experiences and also her writing. Thank you Debby for joining us today and perhaps we could start with the increasingly documented personality trait labelled Narcissistic Personality Disorder. It is only recently that this disorder has become better known as more and more people realise that at some point in their lives they have been subjected to its negative impact. Perhaps you could describe the sort of behaviour that a narcissist would exhibit? Hello Sally and readers of this wonderful blog. Thank you so much for inviting me to this new series to share my stories here with so many other talented artists and writers. A narcissist, in laymen’s terms, sees him/herself as the center of existence. They feel as though their appearance and/or words trump everyone else’s. In my mother’s case, she had created a false persona that she had convinced her own self that she was superior. It was her mission to be the most beautiful one in a room, and craved attention so that focus had to be on her at all times. Everything she talked about was exaggerated to make sure she could captivate her audience with her stories of grandeur. Her wants and needs came first to anyone else’s, including her children’s. She’d go to any lengths to acquire whatever it was she seeked. Now, some people like to tell lies and paint pretty pictures of themselves for attention, but a true narcissist, as in my mother’s case, actually believes her own stories because she lived in her own ego. I learned through the years of studying her, that this was a disease, which commonly wasn’t recognized as such. In the last generation, I don’t believe it was prominently diagnosed. Do we all have some elements of that behaviour and if so what triggers it becoming a full blown disorder? I don’t believe we all have the elements of becoming a narcissist, but I do believe there can be circumstances or incidents one encounters in life that propel one to becoming narcissistic. I’m no licenced psychologist, but I have to believe it can also be linked to various (undiagnosed) mental disorders, such as depression, which becomes a catalyst to narcissism, used to overcome some troubling issues. I say this because I think that besides my mother’s strife to be the best in show, I sensed a sadness within her that she was trying to conceal, not just to everyone, but also to herself. She medicated that inner sadness with booze, pills and gambling, intermittently. She came from a poor family, and in a Scarlett O’Hara sort of way, had used her beauty as a weapon to obtain materialistic things in life. I don’t believe anyone is born a narcissist. I think that it is the situations one lives through, which have a propensity to steer them in that direction as a means to achieve a status to feel better about themselves; and no matter at who’s expense. It is obvious, as in your case, that a child would feel powerless in that kind of relationship. But is also true that adults of narcissistic parents can still be under the influence of that negativity especially as the parents age. What would be your advice to someone facing that challenge? I would have to say the statistics show that many adults are still held under the powers of a narcissistic parent. It’s a major feat to become freed from the power that parents hold over us, mainly from their use of guilt as a means to obtain what they demand. I was petrified to say the word “no” to my mother, my whole life. I danced to her every whim, and there were plenty of them. Children’s psyches are delicate, and grow from what we know and are used to. If we’re obedient, and not defiant children being raised by a narcissist, the odds are we shall remain under their power for the rest of their lives unless we are lucky enough to take a stand to them. For me, it was always unsettling to be around my mother. We have to find a way for ourselves to live comfortably and deal with that parent (in my case.) It is very unlikely that person will ever change because they don’t believe they are the one with the problem. I complied with my mother’s demands all my life and it ate away at me like poison, I took her wraths and tantrums because I felt I had to obey. I was the child, no matter what age I was. It took me decades and barrels of courage to get over the feeling that she had entitlement to anything she demanded from me, as a daughter. With a lot of self-therapy and self-analysis, I tried to reason with her to no avail. Sometimes you have to learn when you can’t fix a broken soul who doesn’t think it needs repairing. In the UK there are around 120,000 divorces a year which is one of the highest in the European Union. In the US I understand that is around the 2.5 million mark per year. Whatever the figure that is a huge number of men and women and of course millions of children who are faced with this life changing event. What do you believe are the key issues that partners find so difficult to overcome that leads to this very final dissolution of their relationship and family? Many times people get married for the wrong reasons, varying from anything such as, for material gain, pregnancy, or just settling for a relationship in order not to be alone, just to name a few. Other times, it could be that people marry too young. Experience shows us that as we grow older, our wants and likes change as we grow. Sometimes people drift into new directions, leaving a partner behind when they no longer share interests. Also, infidelity is a major cause of break-ups, and I believe the promiscuity begins when one isn’t receiving the shared interest, respect, attention or kindness from their partner. They crave acceptance and to be acknowledged or included as a partner in their marriage, and when they stop receiving, they become vulnerable when they meet someone who feeds that need. What would be your advice to anyone in a relationship who is facing potentially serious issues about some of the communication points they should be discussing with their partners to help prevent a complete breakdown? We have to communicate our thoughts and feelings to our partners. We have to open our ears and listen back when they express their feelings to us. We should be supporting their work and passions. This must become a two-way street of reciprocation. If we feel we are giving our all, and we aren’t being paid any mind or consideration for our own thoughts and feelings, this is a good sign we are not in a loving, supportive relationship. This would be the time to seek some outside therapy to salvage a relationship, before it becomes time to sever it. Back to your writing. What is your next major project and where are you in the process? I am currently in revisions with my next book (very late with them I might add), about essays on life incidents. In this book, I recall some stories of past years, when life was different, and often simpler. And, of course, there are stories about how the times have changed, and my opinions about how I feel about it. I’m also writing the sequel to my first book, Conflicted Hearts. I left my first book open to a finish, as my mother was still living at the time of publication. Since that time, she has passed, and I’ve had a lot more realizations and interviews with family members, delving deeper into my mother’s issues, which I didn’t feel was fair to get into while she was alive. I’m hoping to have that book finished and published by summer of 2016. I title this situation with the phrase I’ve countlessly repeated many times throughout my life because I’ve often encountered situations in life where the odds were slim of things happening. Sometimes it wasn’t always a good situation, but in this instance, I lucked out with favourable odds. When I was twenty-five, I took a leave of absence from my then position as an executive assistant to the general manager of a downtown hotel chain. I had a fantasy that I wanted to fulfil of travelling through the Greek islands. Part of that trip I rented villa on the island of Mykonos for six weeks. I travelled alone, as I was fiercely independent and had no trouble meeting people and forging friendships. While I was waiting for three days in Athens for my booked passage over to Mykonos, I had befriended some interesting people staying at my same hotel. One of these people was a lovely Dutch boy, a few years younger than I, who was backpacking through Europe. Another couple I befriended were from Australia, also backpacking and taking on work around Europe to sustain their travels. They were at the same hotel at the same time as I was, all treating themselves to a few days in a nice hotel instead of the usual youth hostels. When we all parted to go our separate ways, I had given them my address in Mykonos, and invited them to drop by if they were on the island in the coming weeks, and I offered them a room to rent in the villa for a nominal fee. I thought it would be nice for them, and it would also give me some extra pocket money. Only a few days had gone by in Mykonos, and I had broken my foot getting off a high step on a bus while going into town for some provisions. Now, that situation alone is a story, which you will find in my book Conflicted Hearts, but nonetheless, my foot was broken, and I wasn’t going to another island to have it casted. I saw a doctor who wrapped it tightly in a tensor bandage, gave me crutches, and told me to keep my leg elevated as much as possible. Walking on crutches on the broken cobblestone roads and struggling to get up the small mountain (and down) on the rickety path to the beach was a feat in itself. A few days had passed and as I struggled again to get to the beach, and find my rock where I elevated my foot, I laid down my things and began thinking that I should cut my vacation short because it was too hard for me to get around. I was sad and scared about my demise. Tears sprang from eyes in my feelings of defeat. And then moments later, I heard somebody shouting my name. I quickly sat up to see where the far away voice was coming from, when I realized God had sent me an angel. My little Dutch friend had come to visit. He stayed for two weeks. He was so kind and helpful. He prepared meals for me, took me to town and carried my things, and helped me up and down the hilly paths. We shared a great friendship for many years after through letters. And, of course, I never took a dime from him. Could lightning strike twice? After my Dutch friend left, a mere one day later, the same miracle happened at the beach when my Aussie friends showed up looking for me. They stayed with me for two weeks. Coincidence? Divine timing? Those who know me well know that I often preach that we meet people; sometimes for reasons, sometimes for a season. Buy Debby’s books and connect with her… Definitely a ‘must do’. Next week John W. Howell author of My GRL… joining us from Texas.